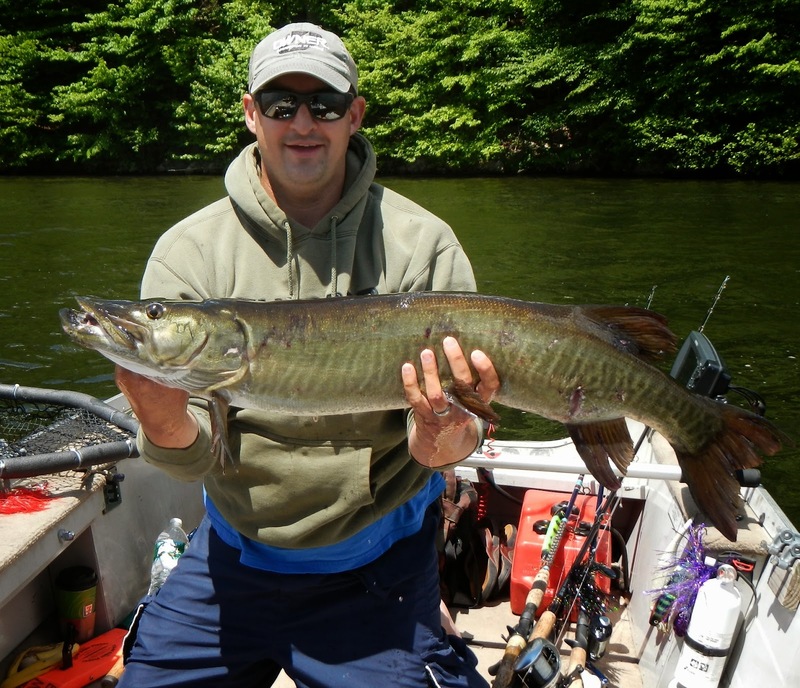 Another musky with battle scars from spawning. Weather: Sunny with a few clouds at times, warm but breezy. Wind N to NE at 14mph and gusting to 21mph. High of 74 degrees. Moon: Waxing, 4 days after new. Rise 8:03am. Overhead 3:23pm. Water Conditions: Partly stained with pollen on top. Greenish hue. 70 degrees. I woke up on Saturday morning after an exhausting day (of fishing) on Friday, and really didn't know what to do with myself. With Lindsay away on business and a whole day ahead of me, I wanted to do some fishing before I spent the whole day on Sunday getting ready to leave for Key West. I didn't feel much like getting everything together to take my boat out, but surely did not want to sit home all day. I called Matt to see what he was up to, and he had been musky fishing since 6am. I asked him if he wanted some company, and he obliged. I talked to him just about 9am, and I was on his boat at 11am. As I drove up to the lake, I had a thought that doesn't normally cross my mind. I tend to be an optimist when it comes to musky fishing, and am usually the guy who will say they're gonna turn on at any minute after not having a bite for 10 hours. But I must admit I didn't have much confidence. The sky was high and blue, I checked the NOAA site to see the high barometric pressure and the wind kept picking up the closer I got. I was still looking forward to catching-up with Matt and tossing some baits around, but I actually said out loud to myself in the car, "there's no way we're catching a fish today." Matt and I started off casting, but the wind picked-up and made it difficult. Since Matt knows a thing or two about trolling, we decided to put the rods out. I have never caught a musky trolling, mostly for lack of trying, so we picked baits and Matt insisted the first fish was mine. After only 15 or 20 minutes, the clicker started ripping. I took the rod out of the holder while Matt kept the boat steady in the wind. After a short fight, I put a 39-inched in the net. We were pretty darn stoked. After a little hootin' and hollerin', we got back to trolling. Then did some casting. Then some trolling. I did have one other follow on a bucktail, but no other fish. Oh, and I fell in the water. That was fun, but you kinda had to be there.